Iconic Britannia Bullion Coins Pay Tribute to Their Eastern Roots! Starting the moment she appeared on the first British Trade Dollars in 1895, the regal and assertive Britannia became a familiar sight for merchants in China and throughout Asia. From the 90% fine silver dollars of the 19th century to the highly pure bullion of the 21st century, the heritage of trade between these two corners of the world continues – with Britannia's flowing robe, outstretched trident and Union Jack shield still featured on British silver coins exchanged today. Now, in its ongoing series that commemorates both the symbolic history of Britannia in Asian commerce as well as the vital role her namesake coin serves there today, the United Kingdom's Royal Mint is releasing its 2019 Britannia Bullion Coin, featuring a gorgeous border inspired by the artistic patterns of East Asia! The coin available in this offer has been graded by the Professional Coin Grading Service (PCGS) as being in near-perfect Mint State-69 (MS69) condition, a distinction that means this almost-flawless coin will showcase an impressive full strike and indistinguishable imperfections – well above and beyond the quality of the vast majority of coins in the series. 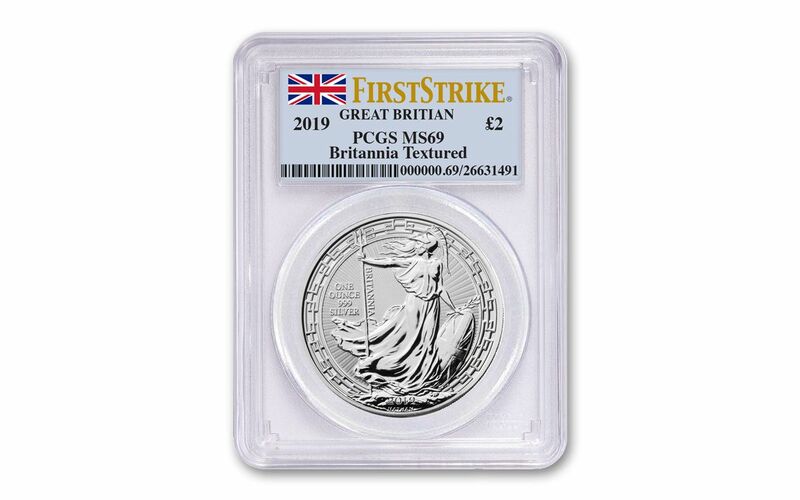 In addition, PCGS has certified this Oriental Britannia to be a First Strike (FS) coin, a designation meaning that it was among the first struck by the mint and was verified within the first 30 days of issue. It will come sonically sealed in an acrylic capsule with a label displaying the British flag. AN ENDURING DESIGN . . . – Philip Nathan's vision of Britannia, the time-honored personification of the British Isles, has been featured on Royal Mint bullion since 1987. Now in her third decade on the Silver Britannia, Nathan's creation looks as beautiful as ever!
. . . WITH A STUNNING TWIST! . . . – Unlike the Britannia Silver Bullion of the past twenty years, this coin features an intricate oriental border evocative of designs found in the Chinese-themed rooms at Buckingham Palace and the Royal Pavilion in Brighton. EXPERTLY MINTED, HIGHLY PURE SILVER – Each Britannia is struck in one ounce of 99.9% fine silver by the artisans of the Royal Mint, resulting in coins that exhibit superb details and lustrous finishes. 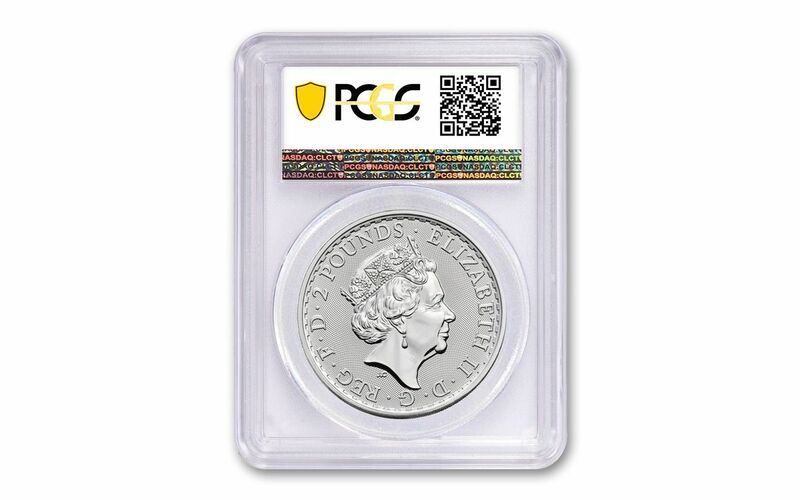 UK LEGAL TENDER – Each One-Ounce Silver Britannia is two pounds sterling United Kingdom legal tender, as struck into each coin's obverse along with Jody Clark's most recent profile of Her Majesty Queen Elizabeth II. In addition, you’ll find the Queen's portrait is set against an elaborately textured guilloche field! GRADED IN NEAR-PERFECT UNCIRCULATED CONDITION – Your coin has been graded by the Professional Coin Grading Service (PCGS) as being in near-perfect Mint State-69 (MS69) condition. KEY FIRST STRIKE CERTIFICATION – PCGS has certified your Oriental Britannia to be a First Strike (FR) coin. It will come sonically sealed in an acrylic capsule with a label displaying the British flag. LOW LIMITED EDITION – The maximum worldwide edition limit for the 2019 Great Britain Oriental Border Britannia One-Ounce Silver Coin has been set at 50,000. Britannia bullion coins have been a massive hit with Britons for decades and are steadily increasing in popularity among collectors in Asia – that's in addition to their already legendary status with stateside silver stackers and Anglophiles! Whether you're already a fan or know someone who is, this coin is one that no Britannia collection should be without. Don't give yourself the slightest chance for disappointment – bring home this phenomenal Silver Britannia Oriental Border Bullion Coin today!